Duke topples Texas Tech in big showdown. 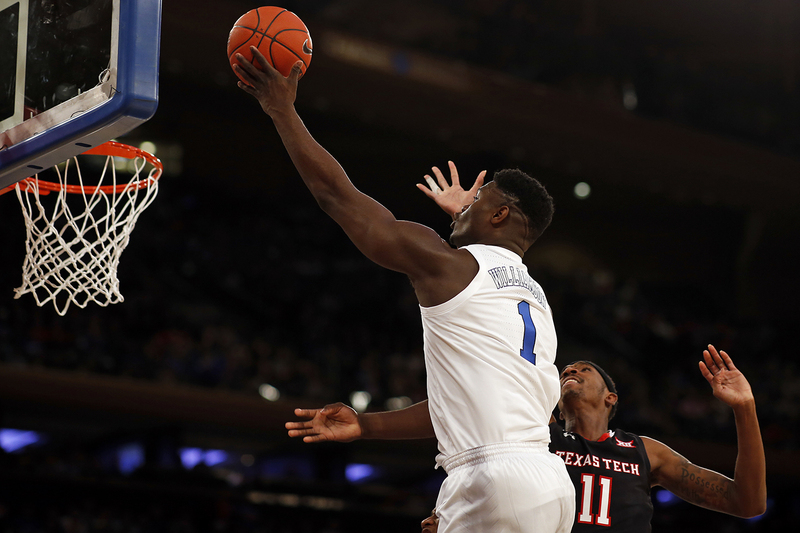 NEW YORK -- Zion Williamson had 17 points, 13 rebounds and Duke fans roaring each time he touched the ball before he fouled out, and the second-ranked Blue Devils ended No. 12 Texas Tech's unbeaten start with a 69-58 victory Thursday night at Madison Square Garden. RJ Barrett scored 16 points for the Blue Devils (11-1) and the program earned its 35th win at MSG. With the Garden rocking from the tip, the Blue Devils must have felt like they had a home game. Cam Reddish hit a late 3-pointer for a 63-57 lead that sealed the win in the first meeting between the programs. Both reached the Elite Eight last season and the atmosphere had a late-March feel. Culver hit a 3 in a back-and-forth game for a 45-40 lead and Williamson came back down and missed Duke's 13th straight 3-pointer. Jack White finally connected on Duke's 15th attempt that tied the game at 45-all and brought "Let's go Duke!" chants to a crescendo. 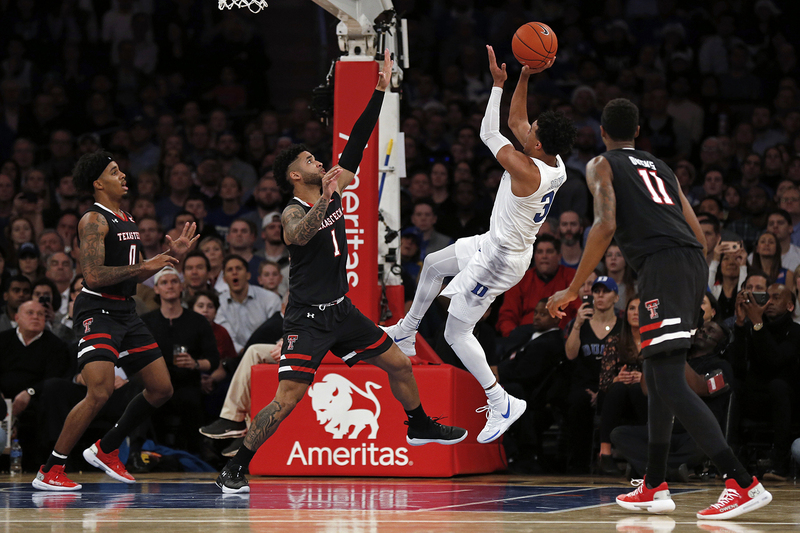 The cheers were quickly muted by Williamson's fourth foul (at 10:32) that forced coach Mike Krzyzewski to sit the likely one-and-done freshman. Duke guard Tre Jones shoots over Texas Tech guard Brandone Francis during the second half. Williamson checked in with 6:31 left and the game tied at 53 and White hit a go-ahead 3 a possession later. Williamson, 6-foot-7 and 285 pounds, was the must-see player in New York. He couldn't stay out of foul trouble and picked up his fifth on a drive to the basket with 3:51 left and Duke up 60-55. But the Blue Devils hung on without their star. Zion Williamson drives to the basket against Texas Tech. This was no ordinary neutral-site game with a couple thousand fans from each side mixed in with casual hoops lovers. Led by Culver, Texas Tech quickly steadied itself and "Raider! Power!" chants soon enveloped the arena. Culver buried a 3 for a 24-17 lead and Texas Tech fans were delirious; one big, sweaty Texas Tech fan bear-hugged another during a timeout and exclaimed "Damn, this is fun!" The half was pretty unpleasant for the Blue Devils. They missed all 10 3-point attempts and Williamson, who had 11 points and six boards in the half, was whistled for his third foul with 3:21 left. Duke: Williamson might need a visit to the dentist. He may have lost a tooth midway and pressed a towel against his mouth.